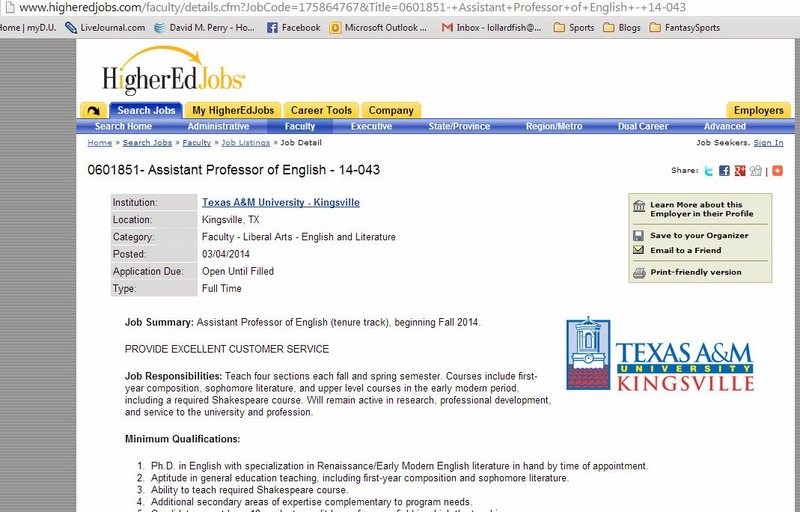 Texas A&M University - Kingsville is hiring an early modern English Professor. A friend of mine, who shall remain nameless, alerted me to this. This is what the end of the world (of Higher Education) as we know it looks like. Here's a screenshot. According to this, the most important aspect of the professor's job, the one meriting all bold capitalized letters, is to - PROVIDE EXCELLENT CUSTOMER SERVICE. This is what happens when HR and MBAs takeover the academic world. This is what happens when corporate forces dig their claws into universities, imposing their attitudes and alleged efficiencies (even as administrative positions bloat, siphoning scarce resources into middle management while demanded we all do more with less. But the worst thing about this is this notion of the customer, that we are selling a product, that we are employees. I am a teacher (and a scholar, but let's leave that out for more). My syllabus is not a contract but a plan. I like the core questions of assessment culture - what might a student learn and how would you know if they have learned it - but not the demand for false quantifiable metrics, the reification of numbers above qualitative relationships. I do not provide service to my students. When I am at my best, and let's face it, I am not always at my best, I drive my students, encourage them, plead, cajole, debate, critique, and praise them. This is not service. And importantly, while our relationship is enmeshed in broad systems of exchange, we are not in an exchange-based relationship. Instead, we co-exist in a community of unequals, but a community none the less, governed by expectations and feedback, evaluations and conversations, and overlapping goals. Students are not my customers and thank goodness for that, because the responsibility of a teacher to his or her students is far greater than the employee to the customer. Who you gonna believe, me or your lying eyes?